I finally have a window! A window with good lighting. A window where I can take my food photos. A window where I can leave out my photo boards and camera and not have to clean up after each photoshoot. Praises! For those of you who don’t take photos of your food on a regular basis (which I’m sure is 99.9% of you), then you probably can’t relate to my excitement. This past year has made being a food blogger incredibly challenging–sometimes even impossible–as I’ve had to seek out good lighting in every new house or hotel in which we’ve lived. I honestly haven’t been very excited or proud of most of the food photos I’ve posted on this site this past year. Ever since we left China in the fall of 2017 to have Harper, I haven’t had access to most of my food photography props or tripod and have constantly had to adapt to a changing environment. 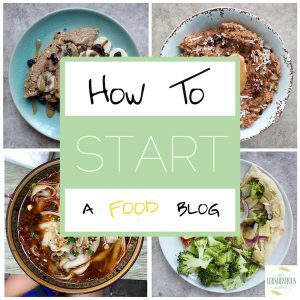 Last summer when I went through Food Blogger Pro‘s photography courses, I so badly wanted to have all the equipment I needed to implement what I was learning, but I didn’t. Even now I still don’t have a tripod or any props, except for some black boards that I found which have been a huge blessing! Before this post turns into me complaining, I want to say that, although this year of nomadic living has made my food blogging hobby incredibly challenging, it has also helped me let go of my desire for perfection. Comparing my food photography to others isn’t doing me any good and just makes me feel bad about myself. 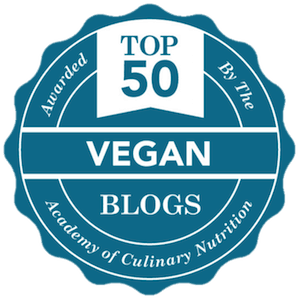 It also causes me to forget why I started this food blog in the first place: to connect with you all and to share yummy, plant-based recipes. Basically, I want to acknowledge that this year has made food photography quite a challenge, but it has also helped me to loosen up a little and embrace the imperfect. That’s probably a lesson I’ll be learning the rest of my life! Okay. 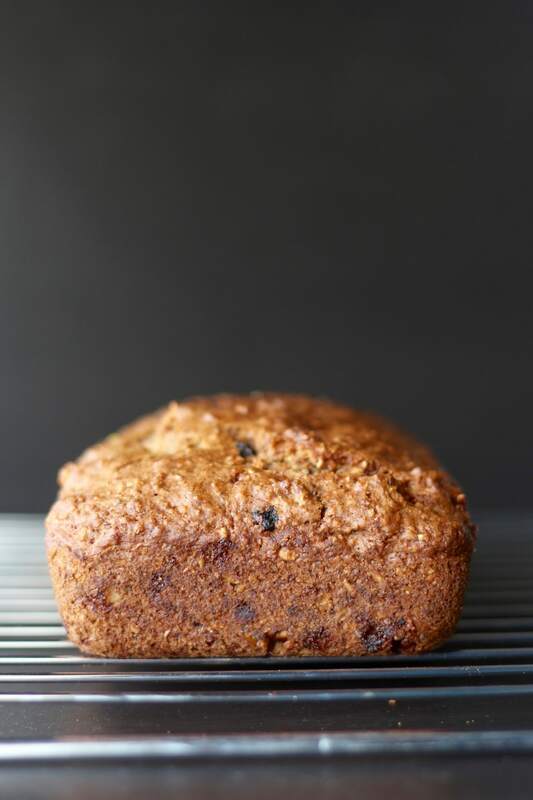 Let’s finally get to why you’re really here: this walnut raisin bread! I’ve been obsessed with looking through cookbooks and recipe-focused magazines lately. For one, being away from the internet and looking at a physical book really helps me to rest and that is something I’m trying to do more of everyday. I also love looking at cookbooks to gain inspiration for recipes to cook for Brett, Harper and I and of course, for recipe to share on the blog as well. I’m the sole cook in our family, so I’m always in need of some new inspiration to keep our meals and snacks exciting. 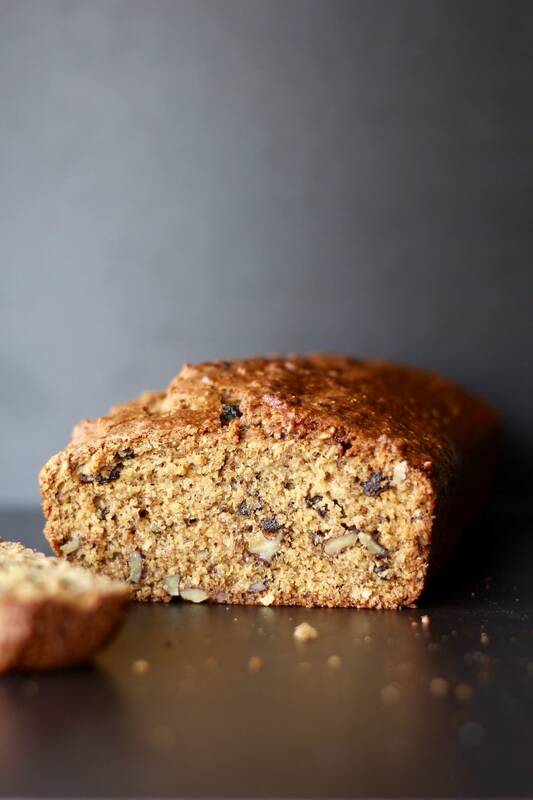 When I saw the original recipe for this bread (which I found in The How Can it be Gluten Free Cookbook Volume 2), I knew immediately that I wanted to make my own version of it. 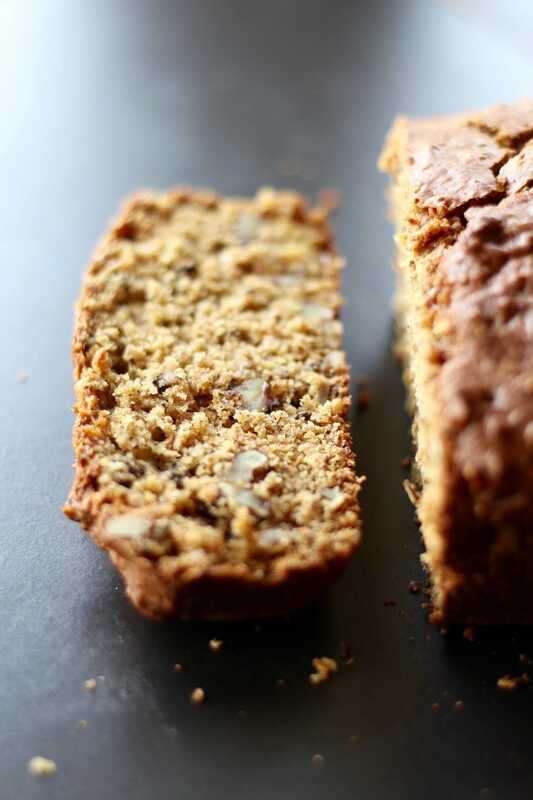 The original recipe was for a gluten-free walnut date bread. I simplified the recipe by using white and whole wheat flour and veganizing the non-vegan aspects of the recipe. I also decided to use raisins instead of dates as I find they are cheaper and require no pitting or chopping. 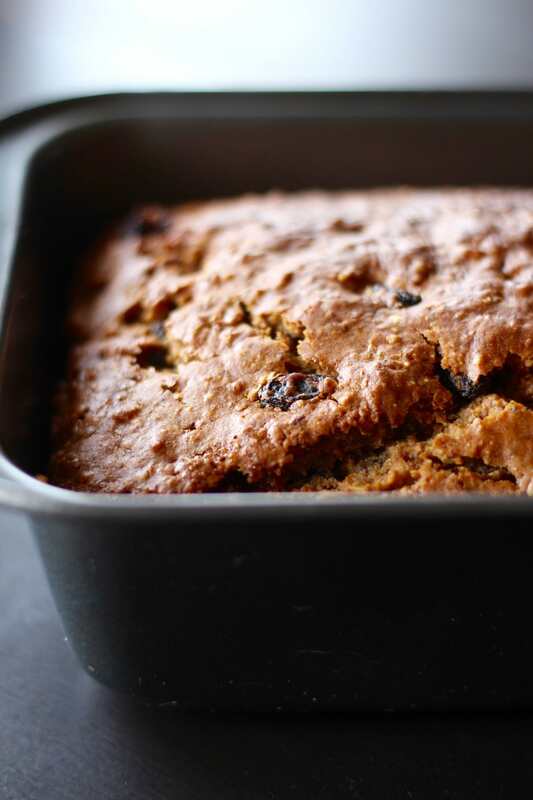 The result was this subtly sweet, perfectly textured walnut raisin loaf. I love cutting a thick slab, warming it up and smearing it with vegan butter or almond butter. It’s the perfect main for breakfast or a quick snack. 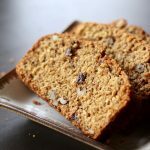 I’d love to know if you give this bread recipe a try and what you think. 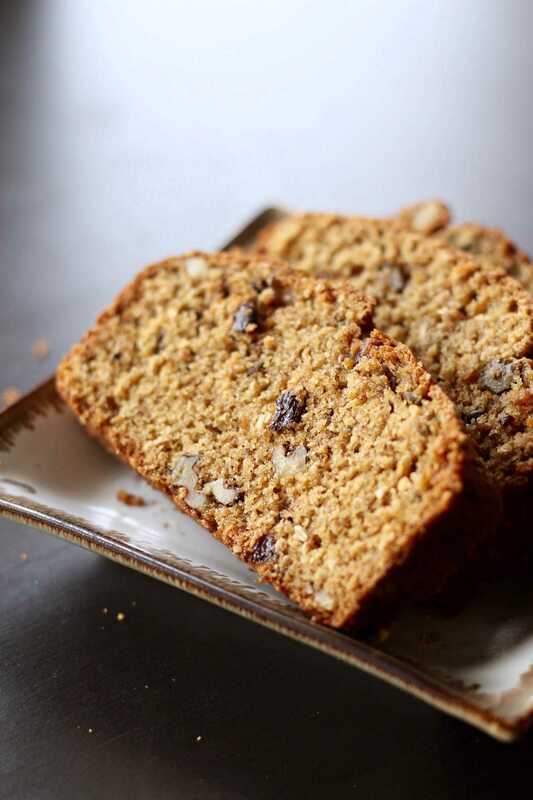 If this recipe doesn’t excited you, though, be sure to check out some of my other favorite quick bread recipes below! Help The World Eat More Plants! 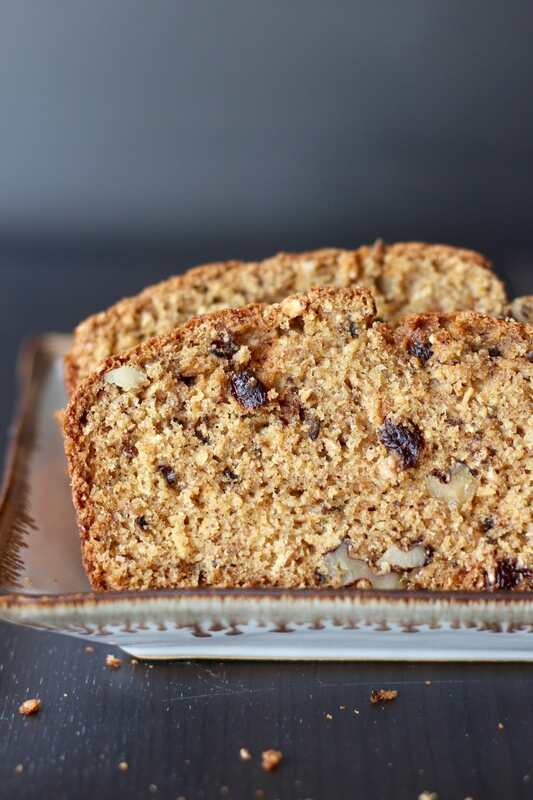 Studded with crunchy walnuts and chewy raisins, this Vegan Walnut Raisin Bread makes for the perfect breakfast or afternoon treat! Preheat your oven to 350 degrees and grease an 8½ by 4½-inch loaf pan. Set it aside. In a small bowl, prepare your flax eggs by whisking together 2 tablespoons of ground flaxseed and 6 tablespoons of water. Set it aside to thicken. In a liquid measuring cup, combine the soy milk and vinegar and set it aside to turn into "buttermilk"
In a large bowl, whisk together all of the dry ingredients, from the flour to the salt. In a separate mixing bowl, whisk together all of the wet ingredients, including the "buttermilk," thickened flax eggs and oil. Add the wet ingredients into the dry ingredients and mix until mostly combined. Stir in the raisins and the walnuts. Pour the batter into your prepared loaf pan and bake for 40 minutes to 1 hour or until a toothpick inserted into the center comes out clean. If the top is starting to brown, but the inside is still soft, you can cover the top with aluminum foil. I'm usually using a smaller oven in Asia, so mine only needed 45 minutes to bake. These pictures are beautiful!! I need to make this ASAP; my daughter is due next week and this looks like a great snack option for late night feeding sessions! Wow, Erin! Next week! That’s so exciting. And yes, make/buy “all the snacks! I was ravenous during breastfeeding. I always kept a snack by my bed for the middle of the night. I hope things go well and that you can give this recipe a try!